2. Put a potato on a cutting board and lay a wooden spoon next to it. Cut 8 or 10 slices down through the potato until the knife reaches the spoon handle; this will leave the base of the potato intact. Repeat with all potatoes. 3. 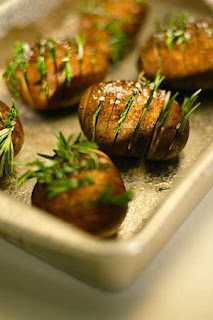 Place the potatoes in a roasting pan, drizzle with the oil and sprinkle with the salt. Place a sprig of rosemary between each slice. Bake until tender, 40 or 50 minutes. 4. For serving, remove the rosemary springs and replace with fresh ones, or sprinkle with shredded cheese.